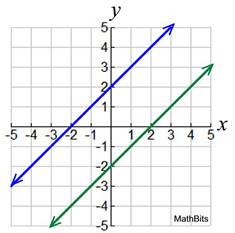 A "system" of linear equations is a set of equations of straight lines. When working with a "system" of equations, you are working with two or more equations at the same time. For our investigations, we will be working with two linear equations at a time. Kyle's little sister, Jenny, claims that she can beat him in a snowmobile race to the next turn in the trail. Kyle takes the challenge and gives her a one minute head start. 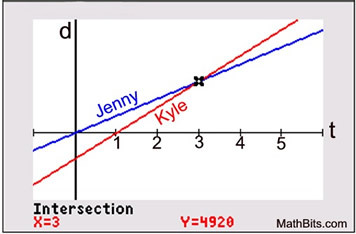 Jenny travels at 1640 feet per minute and Kyle travels at 2640 feet per minute. How long will it take Kyle to catch up with Jenny? Kyle catches Jenny after 3 minutes and traveling 4920 feet. 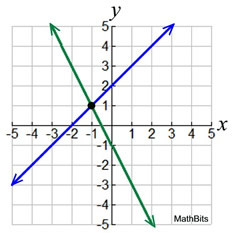 As the example above shows, the main task of working with linear systems is to find where the lines intersect (where they cross one another). There are three main methods used for solving systems of linear equations. • Substitution Method: The goal of this algebraic method is to replace one of the equations with an equivalent expression by solving for one variable in one of the equations. • Elimination Method: The goal of this algebraic method is to eliminate one of the variables using addition or subtraction. The remaining equation will easily yield either the x or the y coordinate of the intersection point. 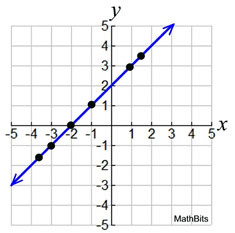 • Graphical Method: The goal of this graphical method is to solve the system by graphing the lines either on graph paper, or on the graphing calculator, and locating the point of intersection, in a manner similar to what was done with the example above. You may need to re-write the equations before beginning your solutions. As we saw in the example at the top of this page, the solution to a system of linear equation will be the location of the intersection of the two equations. But, will there always be a solution? The slopes of the lines are different. This is the most common situation. The lines are the SAME line (one on top of the other). The slopes are the same and the y-intercepts are the same. The lines intersect everywhere and ALL points on the line are solutions.